Hi there! Would you please advise how I would be able to make Numbers 2 & 1 from 5inch balloons, I would like the numbers to stand at least 5foot tall. I have tried using various floristy wire but this is to flimsy, I guess I would need Aluminium tubing of sorts. I would most appreciate your help. 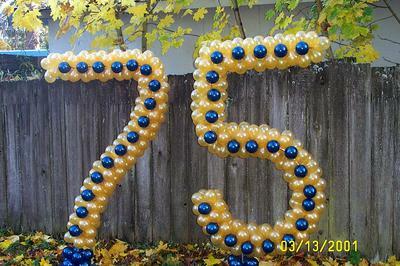 Reply to "Giant Balloon Numbers"
You need a sturdy base plate and solid frame to make the large balloon numbers stay upright. Best is to use heavy material like metal for the base plate. If you use wood as shown in our step-by-step instructions, you'd have to attach bricks or a thick tile to weigh the base down. Regarding your question about disclosures... if you are offering balloon decorating services, I would recommend that you talk to a lawyer about the legal requirements for your contracts. How do you make the giant number stand or make it stay steady all day? Also do you give your customers some disclosures about the balloons? If so please respond. You should be able to get the aluminum rod at hardware stores. Alternatively, you can order it online at Amazon. Below is an example offer from Amazon (depending on the size of your numbers, you'd either need the 1/4 inch or the 1/2 inch rod). Where can I find the rods to do the numbers and letters? I am having difficulty locating the rods. "Do you use 5" balloons or 11" balloons for a 6 foot number?" You would use 5" balloons. 11" balloons are too large to make the bends that are part of balloon numbers look pretty. Do you use 5" balloons or 11" balloons for a 6 foot number? Like with balloon columns or other air-filled designs, the balloon numbers need a sturdy base to make them self-standing. Take a look at the photo above or the examples of balloon numbers on this page to see what I mean (you have to scroll down to see the photos). You can either buy ready-made bases, or make them yourself, as I explain on this page about making a balloon column base. it doesnt say how he got it to stay up?? You are right with your guess that you would need aluminium rod as frame for your numbers. We recommend using 1/4" aluminium rod for smaller and hanging designs. For bigger, self-supporting sculptures like a walk through arch or the kind of numbers you have in mind, you should use 1/2" aluminium rod. Below is a video by Charles Prosper (the "Baron of Balloons") where he shows part of the process of creating the number 15 out of balloons.